Mindfully Fit - effectively maintain levels of fitness with limited time, luggage space, and changing schedules by making the most of odd blocks of time and cramped spaces to optimize flexibility, strength, and overall fitness without packing gym gear. Mindfully Fueled – optimally fuel when lacking control of the menu or venue by managing what you eat and drink to optimize the body’s energy and contribute to your energy and goals of fitness and weight management. Mindfully Centered – begin, work through, and end each day in balance with appropriate energy, focus, and personal centeredness through portable techniques to generate and release energy, build concentration, and manage your response to stress. Mindfully Safe – maintaining personal safety and situational wellness through simple but effective techniques of perception and avoidance and techniques to create space and buy time. Mindfully Mobile provides practical, simple practices for people with little discretionary time who feel the stress of balancing the demands of professional and personal life. It is designed to be read in the time of a flight, practiced in the space of a seat, and tweaked in the course of a life. 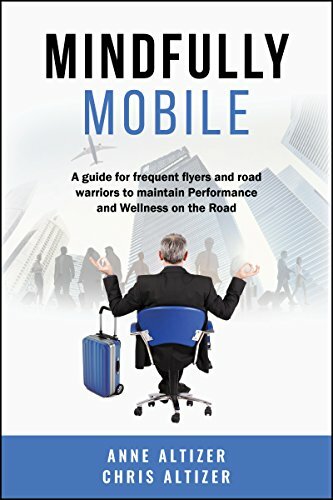 “Effective practices for people on the go that really work— you can read in an hour, try in the moment, and tweak the rest of your life.” ~ Chuck Hill, Executive Vice President, Worldwide Human Resources, Pfizer Inc.
“Mindfully Mobile is an easy read which serves up truly practical solutions for achieving wellness even while on the road. While designed for the business traveler, this book provides a holistic approach to living a balanced life which would benefit anyone.” ~ Ann Palmer, President and Chief Executive Officer at The Arthritis Foundation. “Most of us spend a lifetime figuring out the balance of taking care of ourselves and taking care of our business. The Altizers cover all the bases— particularly for those of us who spend a lot of time in airports, hotels, and meetings.” ~ Jeffrey B. Kindler, CEO Centrexion, Inc., Chairman GLG Institute, Past CEO & Chairman Pfizer, Inc.
“It’s not how much time we have but what we do with the time we make our own. Mindfully Mobile provides you the opportunity to deliberately take a sliver of time and make it personally productive. Read it today, do something today.” ~ Cavan Redmond, Board Member The Wistar Institute, Arthritis Foundation, OncoCyte Corporation, former CEO WebMD.